In November 2014, we announced Fastly’s Cloud Accelerator, a collaboration with Google Cloud Platform that combines the power of Google’s infrastructure with the speed and flexibility of our real-time content delivery network. We're seeing more of our customers leverage cost-effective cloud services to build scalable infrastructure, and so today we're excited to announce that we're expanding our collaboration with Google Cloud Platform. 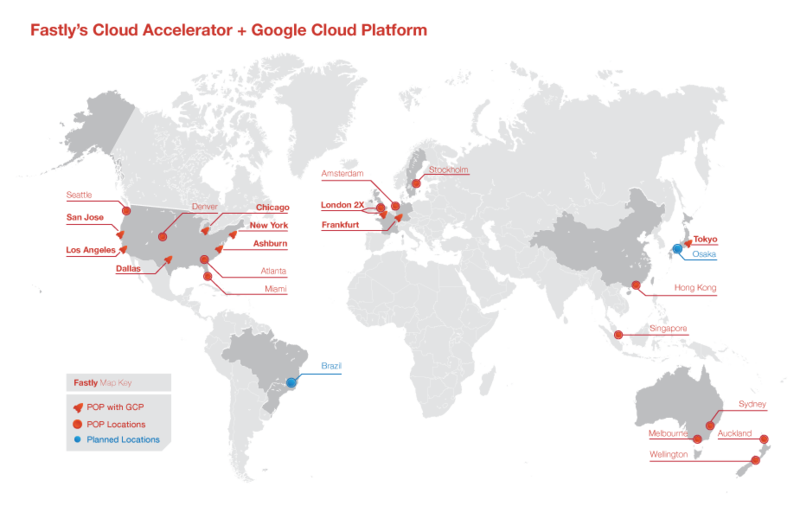 Fastly’s Cloud Accelerator interconnects the Google Cloud Platform backbone and our network in two crucial locations, San Jose, CA and Ashburn, VA. As of May 1st, we now have nine Fastly points of presence (POPs) interconnected with Google, extending the benefits of Fastly to your GCP services all over the world. POPs that connect to Google Cloud Platform now include San Jose, Los Angeles, Dallas-Fort Worth, Chicago, New York, Ashburn, Frankfurt, London, and Tokyo. With this global interconnectivity, Google Cloud Platform customers can leverage Fastly’s network to accelerate dynamic content, cache event-driven content, and use our custom VCL at the edge to help power a wide range of applications. Our private interconnects with the Google Cloud Platform network backbone dramatically reduce latency to your origins on Google Cloud Platform. Bypassing the public internet, traffic between Google and Fastly improves origin response times dramatically. Fastly’s Origin Shield collapses requests to the origin on cache misses, resulting in improved cache hit rates and lower egress costs. Customers using Google Cloud Platform and Fastly can move more application logic to the edge, and expect to see increased scalability for burst traffic and increased speed to innovation. The proof is in the numbers. Fastly’s Cloud Accelerator, in collaboration with Google, is four times faster on the 95th percentile than utilizing other cloud providers. We’ll be speaking about how Fastly’s Cloud Accelerator makes a difference for our customers at Next, a new Google Cloud Platform experience, in NYC, SF, Tokyo, London, and Amsterdam. We’ll also be discussing performance-driven scalability with the Google Cloud Platform team. When we’re not on stage, you can find us in the partner space previewing a cool new demo experience. Join us in the city nearest you — registration is free. Over the next few weeks leading up to Next, I’ll be discussing a few specific uses cases that illustrate why Google Cloud Platform plus Fastly is such a powerful combination — not just for your technology stack, but for your entire business. If you’d like to learn more, sign up for Fastly’s Cloud Accelerator. Lee Chen is Head of Streaming Media and Cloud at Fastly, where he leads new feature development and partnerships for streaming media initiatives.